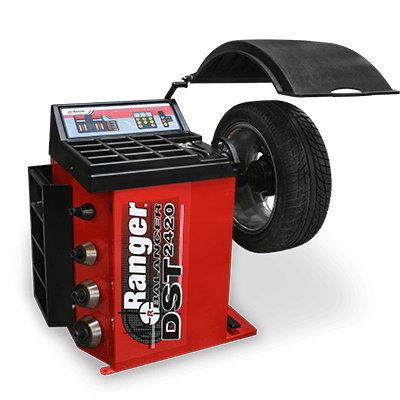 The Ranger DST-2420 wheel balancer handles wheels up to a ​762 mm diameter. It is a highly accurate and dependable no‐frills balancer that features our proprietary Digital Sensor Technology for critical reliability and repeatability. From one-bay shops to high-volume tire stores, the DST-2420 is built with a gritty toughness that puts out perfectly balanced wheels day after day, around the clock. Like all of our DST Series wheel balancers, it’s a zero tolerance performer that features our proven Direct-Axis drive system, accurate to within hundredths of an ounce, ensuring wheels are balanced vibration-free. A touch-pad display panel features tire and wheel assembly graphics to help simplify speed entry of wheel data and guide technicians through balancing procedures. Operator function keys are labelled with simple, easy-to-read icons to help operators identify and command all balancing functions.